I understand that investment in the Tokens is an illiquid investment. 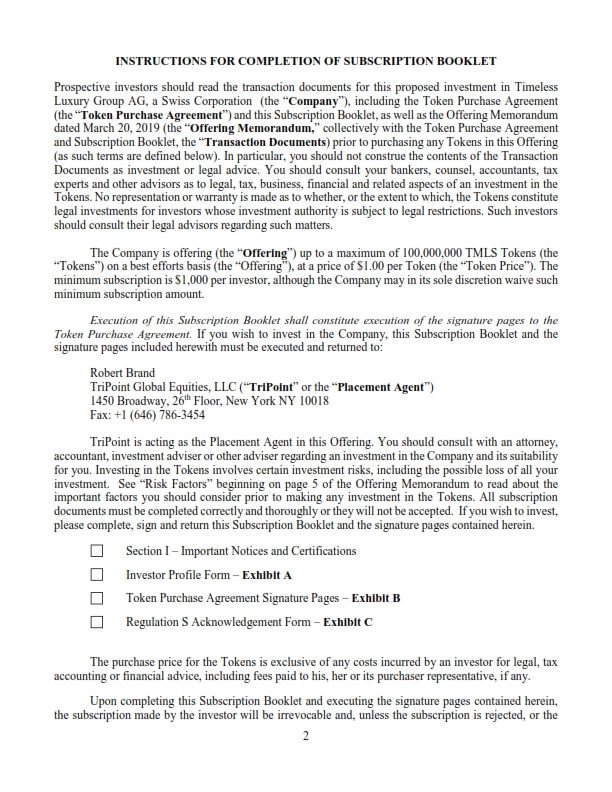 In particular, I recognize that: (i) I must bear the economic risk of investment in the Tokens for a minimum of one (1) year as enforced by the Company's TMLS Token smart contract which shall prevent the disposal of the Investor Tokens for one (1) year pursuant to Reg S, and, only after one (1) year, if requested by the Company, an opinion of counsel or other evidence reasonably satisfactory to the Company to permit the disposal of the Investor Tokens may be provided; and (ii) no established market will exist and it is possible that no public market for the Tokens, or any part thereof or any security underlying any part thereof, will develop. I consent to the programming of the smart contracts representing the Tokens by the Company with such restrictions as to the transferability of the Tokens (or any part thereof) as any applicable federal or state securities law or any securities law of any other applicable jurisdiction may require from time to time. All of the information which I have furnished to the Company and which is set forth in the Subscription Booklet is correct and complete in all material respects as of the date of the Subscription Booklet. If any material change in this information should occur prior to my subscription being accepted, I will promptly furnish the revised or corrected information. I further agree to be bound by all of the terms and conditions of the Offering and the Transaction Documents. I agree to indemnify and hold harmless the Company and its officers, directors, employees and affiliates from and against all damages, losses, costs and expenses (including reasonable attorneys’ fees and expenses) that they may incur by reason of the failure of the undersigned to fulfill any of the terms or conditions of this Subscription Booklet or by reason of any breach of the representations and warranties made by the undersigned herein or in any agreement provide by the undersigned to the Company. 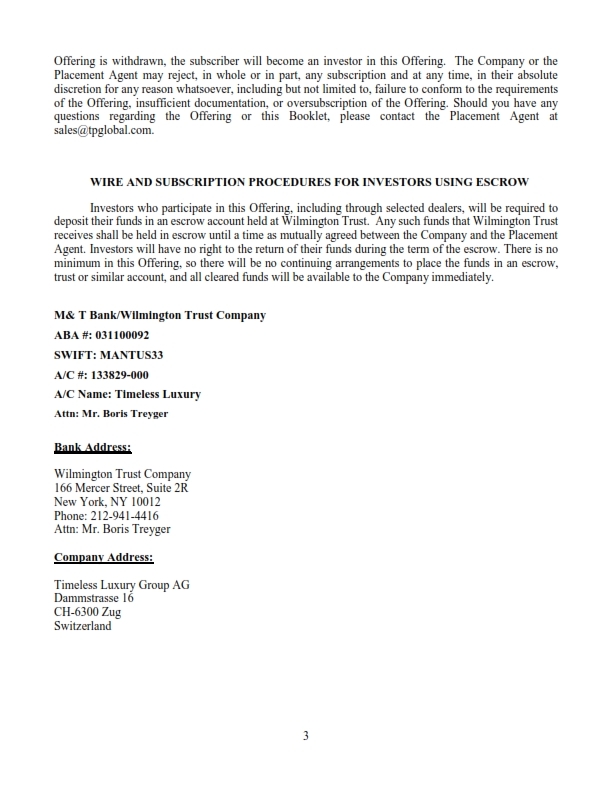 This subscription is not transferable or assignable by me without the written consent of the Company (provided, however, that for the avoidance of doubt, any securities acquired in the Offering are transferrable without the consent of the Company, subject to any restrictions on transfer specified in the other Transaction Documents). If more than one person has signed this Subscription Booklet, the obligations of each such signatory to this Subscription Booklet shall be joint and several and the representations and warranties contained in this Subscription Booklet shall be deemed to be made by, and be binding upon, each of these persons and his or her heirs, executors, administrators, successors and assigns (but, for the avoidance of doubt, such obligations of the persons signing this Subscription Booklet are several, and not joint, with any other investor in the Offering). This subscription, upon acceptance by the Company, shall be binding upon my heirs, executors, administrators, successors and assigns. This Subscription Booklet shall be construed in accordance with and governed in all respects by the internal laws of Switzerland. I understand that the Tokens are suitable for investment only by prospective investors who are based outside of U.S. in reliance on Regulation S of the Securities Act of 1933, as amended, and that I meet the qualifications and requirements under the laws, regulations and rules of my local jurisdiction to purchase the Tokens offered by the Company outside the United States. Accredited Investors may also invest in the securities. (d) Is the Investor a customer of the Wiring Bank? If yes, you are not required to provide the additional information described below. If no, we reserve the right to request additional information from you. In order to ensure compliance with Regulation S promulgated under the Act, any “non-U.S. Person” as defined in Regulation S wishing to participate in this Offering must make certain necessary representations and warranties in connection with the verification of its status as a non-U.S. Person. See Regulation S Acknowledgement Form below. 1. Investor. 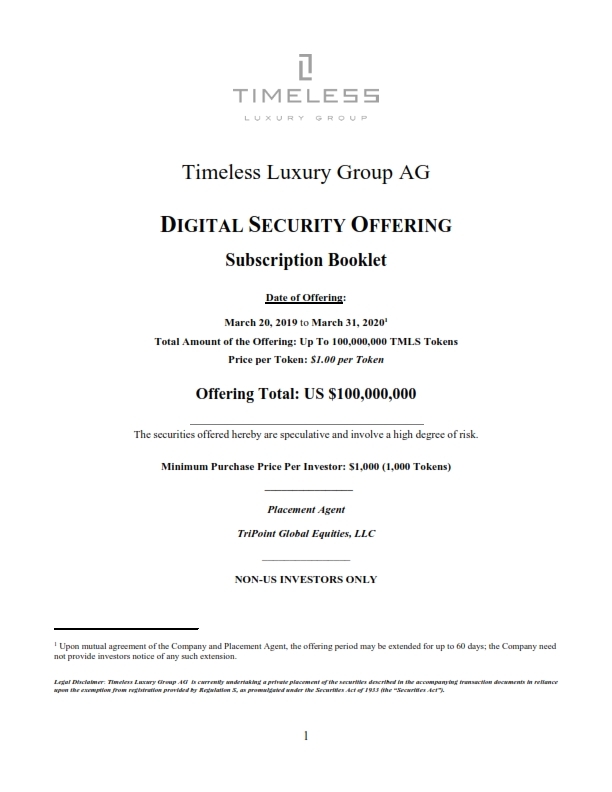 I (sometimes referred to herein as the “Investor”) hereby agree to purchase the Securities pursuant to Regulation S from Timeless Luxury Group AG, a Swiss Corporation (the “Company”), on the terms and conditions described herein. 2. Disclosure. (a) I understand that this offering is made outside the United States and may not be made to any “U.S. person” as defined in Rule 902(k) under the Securities Act of 1933, as amended (“Securities Act”) (a “Non-U.S. Person”); and (b) the Company may not register any transfer of the Securities not made in accordance with Regulation S under the Securities Act (“Regulation S”), pursuant to registration under the Securities Act, or pursuant to an available exemption to registration; provided, however, that if the Securities are in bearer form or foreign law prevents the Company from refusing to register the Securities transfers, other reasonable procedures are implemented to prevent any transfer of the Securities not made in accordance with the provisions of Regulation S.
THE SECURITIES REPRESENTED BY THIS CERTIFICATE HAVE NOT BEEN REGISTERED UNDER THE U.S. SECURITIES ACT OF 1933, AS AMENDED. THE SECURITIES WERE ISSUED IN A TRANSACTION EXEMPT FROM THE REGISTRATION REQUIREMENTS OF THE SECURITIES ACT PURSUANT TO REGULATION S PROMULGATED UNDER IT. THE SECURITIES MAY NOT BE OFFERED OR SOLD IN THE UNITED STATES UNLESS REGISTERED UNDER THE SECURITIES ACT OR AN EXEMPTION FROM REGISTRATION IS AVAILABLE. TRANSFERS OF THE SECURITIES REPRESENTED BY THIS CERTIFICATE MAY NOT BE TRANSFERRED EXCEPT IN ACCORDANCE WITH THE PROVISIONS OF REGULATION S, PURSUANT TO REGISTRATION UNDER THE SECURITIES ACT, OR PURSUANT TO AN AVAILABLE EXEMPTION FROM REGISTRATION. FURTHER, HEDGING TRANSACTIONS WITH REGARD TO THE SECURITIES MAY NOT BE CONDUCTED UNLESS IN COMPLIANCE WITH THE SECURITIES ACT. (h) I understand that the Company is entitled to rely upon this Acknowledgment and is irrevocably authorized to produce this Acknowledgment or a copy hereof to any interested party in any administrative or legal proceeding or official inquiry with respect to the matters covered hereby.